Region 1 Building STEAM Conference is Jan. 5-6, 2018 in beautiful Humboldt County. Keynote speakers are Dr. Karen Crow Roark, NASA’s STEM Education Professional Development Specialist and Dr. Ann Marie Thomas of the Playful Learning Lab, University of St. Thomas. Looking for an opportunity to build leadership capacity in arts education planning? Join us on February 26, 2018 in Fresno for an amazing professional learning day. Click HERE for the flyer and registration information. Register TODAY for CCSESA’s Annual Arts Learning Colloquium to be held in Sacramento at the Crocker Art Museum where participants will hear from arts experts, visit the exhibits and participate in professional learning aligned to state standards. Participants will also attend the matinee of the musical production of An American in Paris sponsored by the California Musical Theatre Broadway Sacramento. and the California Department of Education. Don’t miss the statewide launch of the Public Will Campaign at the Create CA Arts Education Convening! Register NOW at https://bit.ly/2veS1Ws for the early bird price of $150 for both days! Yosi Sergant has dedicated his career to engaging with the principle belief that, it is “through the lens of culture that we understand the world around us, and we can either shape that culture or allow it to shape us.” Sergant is considered by many one of the premier voices and most prolific producers of strategic cultural organizing and has been invited to speak at and consult with some of the most important foundations, universities, companies and think tanks worldwide. During the 2008 Presidential campaign, Sergant engaged artists in a vast viral movement, supporting then candidate Senator Barack Obama, the most prominent of which is the now ubiquitous “HOPE poster” he commissioned and ran with artist Shepard Fairey. Sergant, commissioned and supported thousands of creative projects during the campaign with the intention of decentralizing endorsement to include people who normally don’t participate in the election process. Following the election, Sergant served in the White House Office of Public Engagement before accepting an appointment as the Director of Communications for the National Endowment for the Arts. In 2010, Sergant launched TaskForce, the premiere pro-social cultural organizing agency that engages leaders of the creative community in strategic, high-impact initiatives designed to raise awareness and build momentum for organizations tackling our world’s most pressing challenges. Yosi Sergant is considered by many one of the premier voices and most prolific producers of strategic cultural organizing and has been invited to speak at and consult with some of the most important foundations, universities, companies and think tanks worldwide. During the 2008 Presidential campaign, Sergant engaged artists in a vast viral movement, supporting then candidate Senator Barack Obama, the most prominent of which is the now ubiquitous “HOPE poster” he commissioned and ran with artist Shepard Fairey. Sergant commissioned and supported thousands of creative projects during the campaign with the intention of decentralizing endorsement to include people who normally don’t participate in the election process. 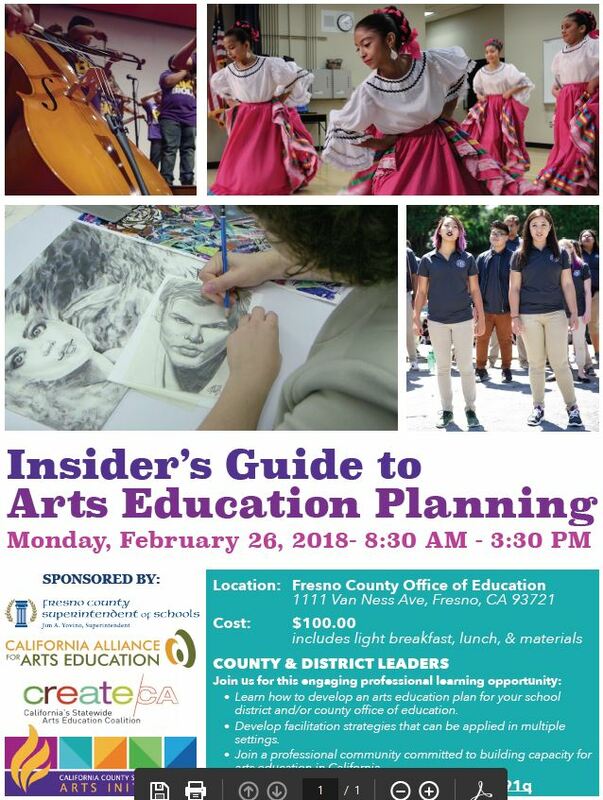 In an effort to expand arts learning access in rural communities statewide, we hope to gather educators, arts leaders, and community members from cross California to join in a discussion to further understand both the challenges and opportunities that exist in rural communities across the state. What will we do in the Think Tank? Collaborate with other educational leaders from across California. We hope that you will participate and share your insights and understandings as we explore together how to deepen and expand arts education for our students. How can we work together to make change? County and District leaders, School Principals, Arts Leaders, County Arts Leads, Curriculum Coordinators, District Arts Coordinators, Arts Specialists, Teachers, and Parents. Learn research about the effectiveness of arts integration to impact student achievement. Experience culturally and linguistically responsive strategies for interdisciplinary learning across subject matter and grade levels K-12. Learn about the new statewide TPE’s teaching performance expectations for arts in K-12. Engage in hands-on effective strategies for powerful arts integration in the classroom in Humanities and STEM. Learn more about Title I and the Arts. Develop structures by which your own districts can plan for and implement arts integration strategies alongside Common Core. Learn about the ART=OPPORTUNITY campaign and receive Creativity at the Core resources. Network with colleagues from across California and so much more! Merryl Goldberg is a Professor of Music at California State University San Marcos and Director of the ART=OPPORTUNITY campaign of Center ARTES, a university center dedicated to restoring arts to education. Her publications include Arts Integration: Teaching Subject Matter Through the Arts in Multicultural Settings 5th edition (2017) as well as other books, articles, chapters, editorials, and blogs. She has received numerous research and programmatic grants including Federal Department of Education Arts in Education Program, Fulbright-Hays Foundation, National Endowment for the Arts, California Arts Council, Stuart and Panta Rhea foundation grants. She is a member of the CREATE CA Leadership Council. Merryl’s undergraduate degree is from New England Conservatory of Music, and her doctorate is from the Harvard Graduate School of Education. Prior to entering academia, she recorded numerous CDs and was on the road for 13 years playing the saxophone with the Klezmer Conservatory Band. She is a member of the Harvard Graduate School of Education. Prior to entering academia, she recorded numerous CDs and was on the road for 13 years playing the saxophone with the Klezmer Conservatory Band. Merryl’s hometown is Boston. Go Red Sox! Fee includes breakfast, lunch, and materials. Participants will receive Merryl Goldberg’ s textbook entitled Arts Integration, Teaching Subject Matter through the Arts in Multicultural Settings, by Merryl Goldberg (5th Edition, 2017). Join us in celebrating March as Arts Education Month. Many communities across California are spotlighting the importance of the dance, media arts, music, theatre, and visual arts education for all students. As we celebrate the benefits and value the arts bring to our schools and communities, we want to ensure that all students have access to quality arts learning in their schools. To view the Senate Resolution for California, click here.